Real-time anti-malware protection — Block viruses, Trojans, worms, adware, spyware, and other potentially unwanted programs that steal confidential data and sabotage user productivity. Unrivaled centralized management — The McAfee ePolicy Orchestrator (McAfee ePO) platform with Real Time for McAfee ePO provides instant visibility and control over security defenses and unifies controls over all your security and compliance tools, from McAfee as well as third parties. Strong device control — Comprehensive device control monitors and restricts data copied to removable storage devices, ensuring that sensitive information remains safe. A mobile workforce plus increased regulation could equal a security nightmare. With integrated, proactive security to combat sophisticated malware and zero-day threats, McAfee® Endpoint Protection—Advanced suite protects endpoints when they leave your network and helps protect your network when they return. Its integrated intrusion prevention secures endpoints—including the ones that stay in the office—from advanced persistent threats. Centralized policy-based management, multi-platform support, and auditing keep all of your endpoint assets safe and compliant. Only behavioral and system-level defenses can protect endpoints against the most insidious malware, designed to avoid signature-based detection and to work before patches are released. Although every endpoint is at risk from the subtle technologies criminals use today, portable systems face extra threats. Laptops venture to hotels, coffee shops, and home offices without traditional protective layers, such as web and email gateways, network firewalls, and network intrusion prevention systems. On a Wi-Fi network, anyone might listen and pick up more than the news. PCs can miss patches and other updates, becoming even more vulnerable to zero-day threats by simply being disconnected from the corporate network. And those patches and other updates are increasingly required for regulatory compliance. Beyond more stringent industry regulations, your governance controls may expect you to manage distribution of sensitive data as well as appropriate web use—on-site or on the road. The McAfee Endpoint Protection—Advanced suite puts you in charge with broad protections, compliance controls, and unified management. Whether you want to keep viruses, hackers, spammers, data thieves, or auditors at bay, this seamless solution has the perfect combination of capabilities and cost savings. Guard all Windows, Mac, and Linux endpoints against system, data, email, web, and network threats. Use Real Time for McAfee ePO to understand the health, configuration, and state of security defenses in moments, then target updates, changes, and installations to the systems that need them. You can also monitor to confirm installations as they progress. Consolidate endpoint and data security efforts with an integrated solution from one vendor — securing stronger protection at a lower cost. McAfee enables you to manage security from one centralized console and connect to other McAfee and third-party products, improving visibility and expediting response times. Enable increased protection without delay. The EASI installer gets your strong protection running in just minutes with a few clicks. Endpoint Protection Suite is integrated with the McAfee ePolicy Orchestrator (McAfee ePO) platform so you can so you can deploy and manage security using a single environment. Secure zero-day protection against new vulnerabilities with integrated McAfee Host Intrusion Prevention. It reduces the urgency to patch existing systems. Ensure seamless control of web traffic. Host web filtering technology restricts access to inappropriate websites, regardless if users are on or off the corporate network. Boost security and productivity with application blocking that prevents unwanted programs from running on your systems. Monitor and restrict data copied to removable storage devices and media to keep it from leaving company control. Integrate compliance reporting for HIPAA, PCI, and other regulations with the built-in McAfee Policy Auditor. With the unprecedented growth of advanced persistent threats, enterprises cannot depend on solutions that use only signature analysis for endpoint protection. There’s a gap of 24 to 72 hours from the time a threat is identified to the moment its signature is applied to endpoints. In the meantime, your data and systems are exposed. The built-in McAfee Global Threat Intelligence™ file reputation service closes the gap, providing real-time, always-on protection based on insight gathered by McAfee Labs. Our solution scans your inbound and outbound emails to intercept spam, inappropriate content, and harmful viruses. We can quarantine suspicious emails to prevent evolving email threats from affecting your network and users. And, a layer of antivirus on your email server prevents malware from reaching user inboxes. Say goodbye to emergency patching. Host intrusion prevention patrols your endpoints against malware, blocks malicious code from hijacking an application, and provides automatically updated signatures that shield laptops and desktops from attack. It’s safe to implement and test patches on your schedule. Combined with our patented behavioral protection, which prevents buffer overflow attacks, you get the most advanced system vulnerability coverage on the market. You can control desktop applications that can access the network to stop network-borne attacks and downtime. Deploy and manage firewall policies based on location to deliver complete protection and compliance with regulatory rules. Agent-based policy auditing scans your endpoints and documents to ensure that all policies are up to date. Organizations can measure compliance to best practice policies—ISO 27001 and CoBIT—as well as to key industry regulations. Prevent critical data from leaving your company through USB drives, Apple iPods, Bluetooth devices, recordable CDs, and DVDs. Tools help you monitor and control data transfers from all desktops and laptops—regardless of where users and confidential data go, even when users are not connected to the corporate network. Help ensure compliance and reduce risk from web surfing by warning users about malicious websites before they visit. Host-based web filtering ensures that you can authorize and block website access, protecting users and ensuring their policy compliance whenever and wherever they are web surfing. For efficiency and comprehensive visibility across your security and compliance status, McAfee® ePolicy Orchestrator® (McAfee ePO™) software provides a single, centralized, platform that manages security, enforces protection, and lowers the cost of security operations. Web-based for easy access anywhere, it provides intelligent security for quick and effective decisions and greater control. Correlate threats, attacks, and events from endpoint, network, and data security, as well as compliance audits, to improve the relevance and efficiency of security efforts and compliance reports. No other vendor can claim a single integrated management platform across all these security domains. McAfee ePO software simplifies security management. Real Time for McAfee ePO software uses a scalable peer-to-peer methodology for querying information from all your endpoints in mere moments, with no extra hardware. This allows administrators to assess the security state and health of McAfee defenses whenever they need to. Then, through its unified dashboard and predefined actions, the workflow from diagnosis to mitigated risk takes minutes, not days. This groundbreaking technology dramatically reduces the exposure, risk, and cost of security events, outages, potential breaches, and damaged reputations. Enhance situational awareness and incident response for front-line endpoint administrators using an approach that scales to the largest organizations. These are minimum system requirements only. Recommended requirements are in parenthesis, where applicable. Actual requirements will vary depending on the nature of your environment. 64-bit operating system support is available for some technologies. 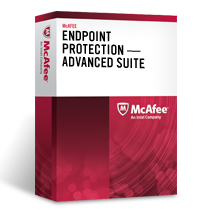 Download the McAfee Endpoint Protection Advanced Suite Datasheet (PDF).